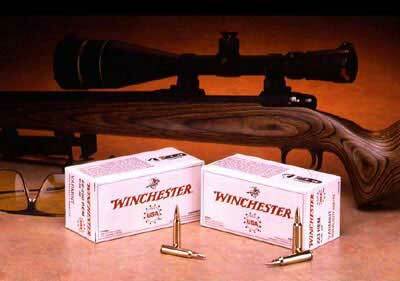 The popularity of varmint hunting continues to grow and Winchester Ammunition has introduced two value-priced loads to meet the need of high volume shooters. 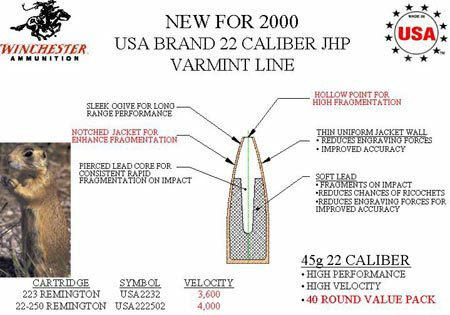 Both of the new USA brand 223 Rem and 22-250 Rem loads will use a new 45 gr. jacketed hollow point bullet developed by Winchester. The new bullet was designed with the serious varmint hunter in mind. Features of the bullet include a sleek ogive for long-range performance. The thin, uniform jacket wall and soft lead core will provide excellent accuracy. A pierced lead core and hollow point design creates consistent rapid fragmentation upon impact thus reducing penetration for varmint applications and minimizing the ricochet potential on ranges. Both loads are very high velocity with the 223 round having a muzzle velocity of 3600 fps and the 22-250 round having a muzzle velocity of 4000 fps.